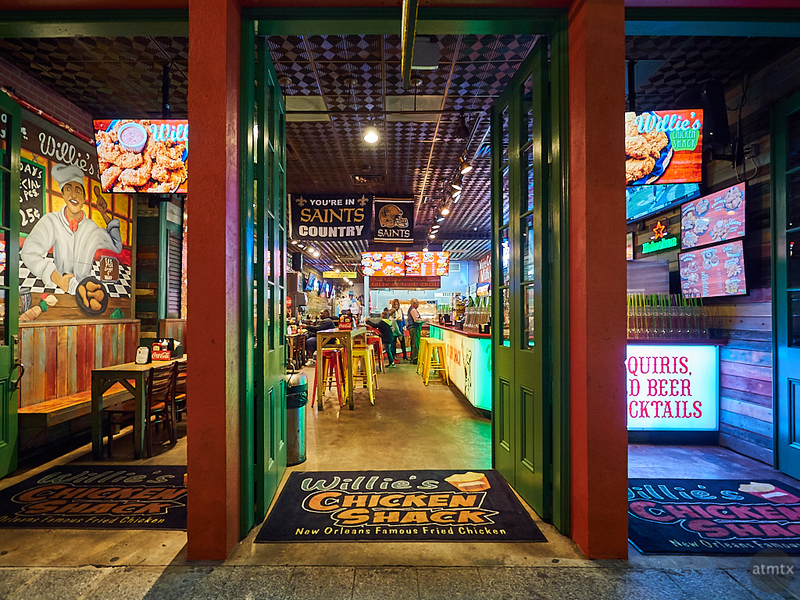 One of the surprising local fast food places we found in New Orleans was Willie’s Chicken Shack. It was late at night, and surprisingly, we didn’t find many open restaurants, and happened on this place. The fried chicken was fantastic. They also had the classic cajun sides like gumbo, red beans and rice, and jambalaya. My wife and I even indulged on a slushy cup of alcohol with flavored and colored ice, better known as a daiquiri. We noticed several Willie’s in our walks around the historic quarter. Research revealed that there are only seven restaurants, all located in the French Quarter. There’s a larger chain called Raising Cane’s in Texas, headquartered out of Baton Rouge, Louisiana, but Willie’s has them beat by a mile. Too bad there’s no Willie’s nearby. Beyond the food, I was also attracted to the colorful interior, like many places I found in New Orleans. I didn’t miss a chance to create a wide-angle photo with my Olympus. Sort of odd, I suppose, but I like making images like this. Everyday locations not typically captured on a tourist’s visit.